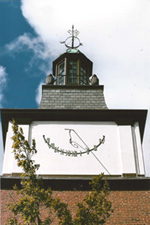 A vertical south-facing dial, simple in design and visible to the shoppers in the U-shaped town square below. The dial face is plane white with Roman hour numbers fastened to a rod bent in an ellipse. No other delineation (such as solstice and equinox lines) is on the dial face. The gnomon is a simple rod held by an "S" shaped support. The town's Market Square was constructed in 1916, but the dial design is very recent.